This is a scarce 1911 or Meiji 44 Japanese map of Korea or Corea. This map of Korea, made in the 44th year of Emperor Meiji's reign, covers all of Peninsular Korea (Corea). All major roads, waterways, railroads, shipping lines are noted, including various other topographical details. 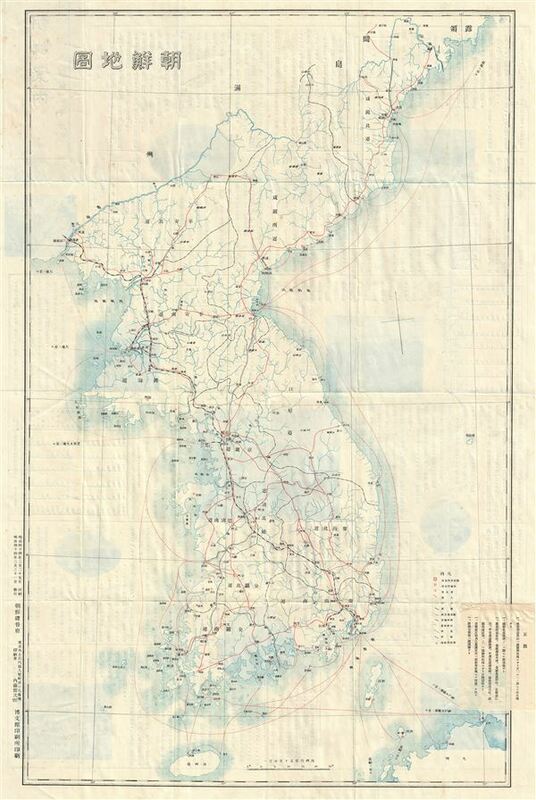 The map, issued by the Korea Governor's Office, was prepared by the Japanese shortly following the 1911 Annexation. Very good. Minor wear along original fold lines. Japanese text on verso. A small tab with Japanese text is attached to the right margin.